Using Soundcloud and YouTube, astronaut Chris Hadfield beamed a song from space to Earth. 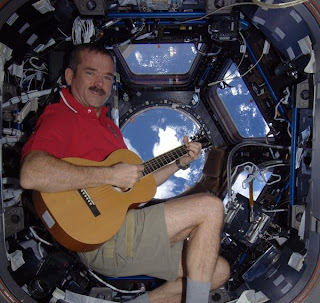 Hadfield recorded "Jewel in the Night" aboard the International Space Station this week, saying, "You can hear the slight buzz of the station's fans in the background." He adds the song is "some of the first original music written for and performed on" the ISS. "Our stockings are hung by the Node 3 hatch with care, in hope that St Nicklaus has a big red spacesuit. Music on High - playing Christmas carols while floating over the eastern Mediterranean. Miraculous." Days before launching into space to arrive on the ISS, Hadfield participated in "Ask Me Anything" session on Reddit. In his introduction, he explained that he attempts to routinely check his social media for questions and comments from followers.